NOTE: We always recommend that you should have a survey carried out by a Gas Safe registered gas installer, HETAS installer or qualified NICEIC electrician (whichever is applicable to the goods you intend to purchase) to check and certify the compatibility of your chimney, flue, property and or circumstances prior to purchase to avoid disappointment. The gas fire supplied with this fireplace suite also requires a mains power supply in your intended location for the remote control system to work. We also recommend that you should wait until you have the goods purchased, onsite, in your possession to take accurate measurements from before proceeding to carry out any building work or create any apertures in the wall to avoid potential costly mistakes being made, as manufacturers reserve the right to alter products or specifications without any prior notice as required. 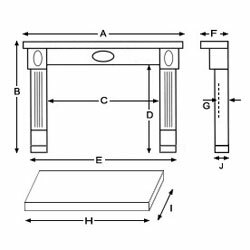 All measurements are in millimetres and can have a tolerance of +/- 5mm as each fireplace is handmade. 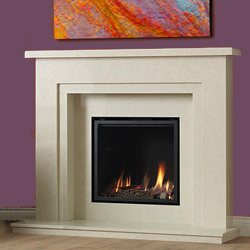 The delivery service offered on an Apex Marble Fireplace is based on a one man, kerbside, only delivery. Due to the nature and weight of this product, you will need to arrange additional assistance to offload the goods from the vehicle when it arrives at your delivery address. All Apex Fireplaces are delivered on a pallet normally by a vehicle in excess of 7.5 tonnes or more so please ensure to advise us in writing by email if your property has any difficulties with access so alternative arrangements can be made to avoid incurring additional costs in the event a delivery cannot be made if the vehicle cannot deliver safely to your location.